This fall I’ve had precious little time to print, but I have managed to get a couple of projects underway, one of which came to fruition this week when I received 8 boxes of the 7th issue of my roughly annual magazine, AMERARCANA: A Bird & Beckett Review, which was guest edited this time around by poets David Meltzer and Steve Dickison, erstwhile editors of SHUFFLE BOIL: A Magazine of Poets and Music, which ran four single issues (#1-4) from winter 2002 through fall 2003, with a double issue (#5/6) following in 2006, all published under Dickison’s Listening Chamber imprint. Another issue was planned, and some materials gathered, but it never came to be. 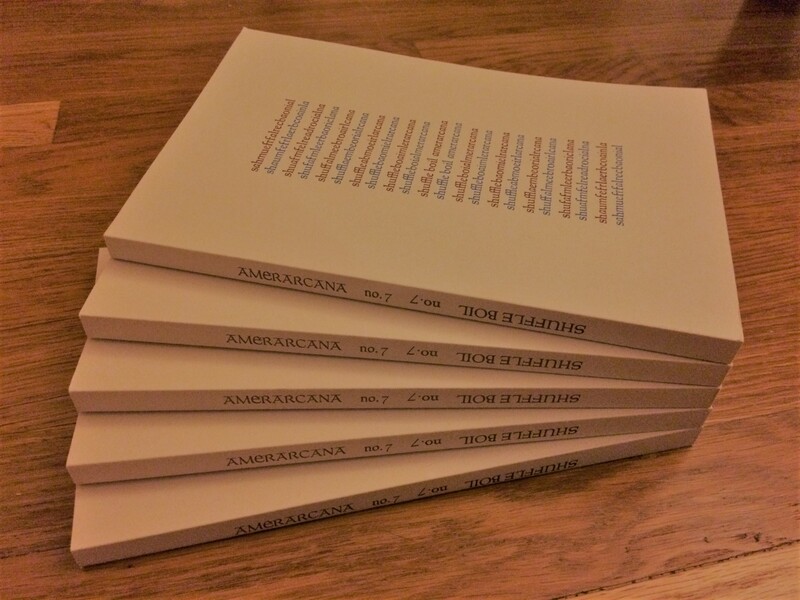 Since 2010, a few pieces slated for publication therein have made their way into one or another of the first six issues of AMERARCANA; however, what appears here was gathered newly over the last several months. This, then, is #7 of both magazines: 160 pages bound in wrappers designed and printed from hand-set lead type once belonging to William Everson (aka Brother Antoninus) in Santa Cruz, CA. 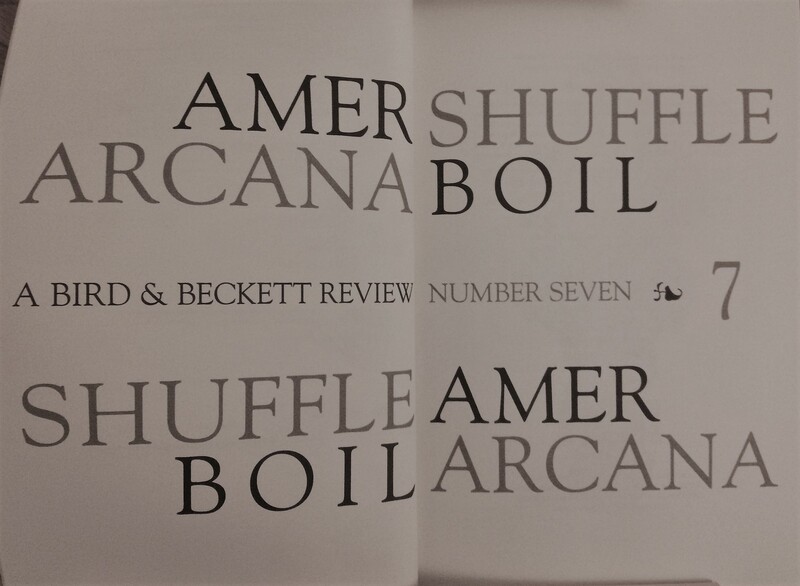 I used Goudy Thirty and Goudy Newstyle for the titles “Amerarcana” and “Shuffle Boil” respectively, shuffling the letters of one title into and out of the other (or vice versa), so in the top and bottom lines the letters alternate, and at center they’re fully separate. The different faces and the ligatures of the Newstyle made it a little more difficult than anticipated, and there’s one wee typo I somehow missed in proofs, but I’m pretty happy with the result. 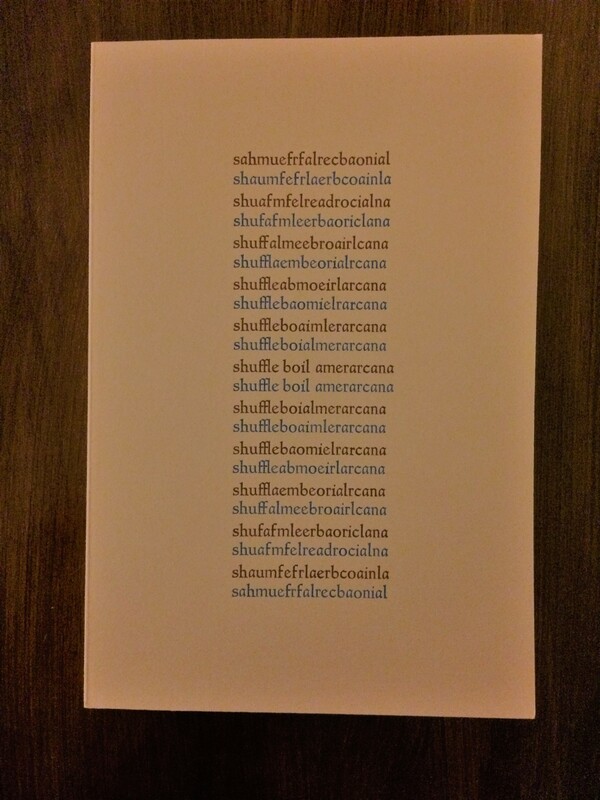 Printed on Fawn Stonehenge paper in blue and brown ink. The interior layout is all in Goudy Oldstyle. Get one here. 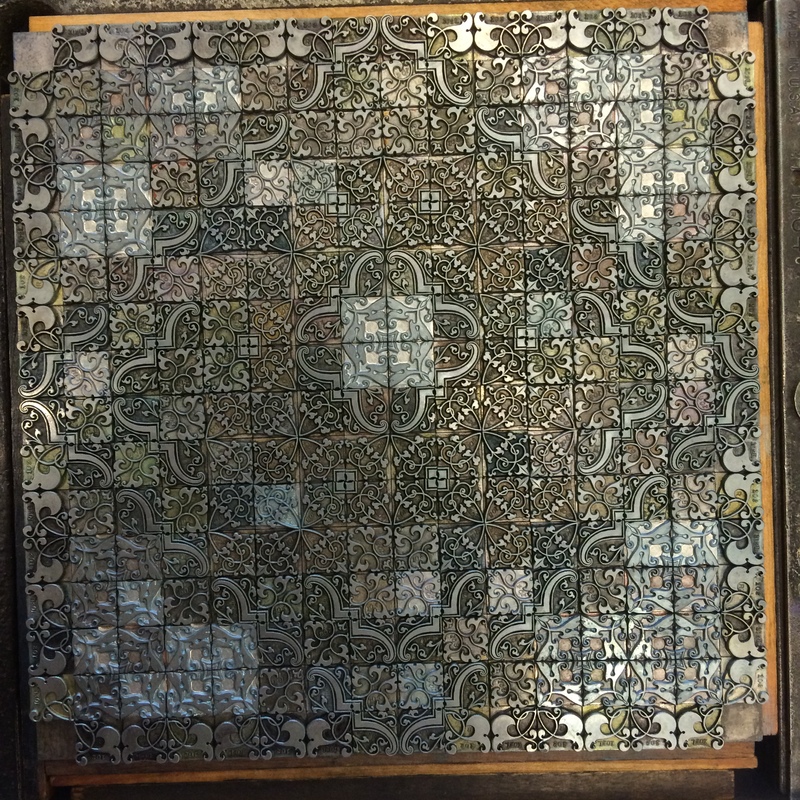 These gorgeous bits of lead have really excited me, and I’ve begun to toy with other possibilities. There may be whole series of prints soon, so if you dig it, stay tuned.